You will earn 0 Kority Points for buying this product. Pot of Gold baby balm as a natural alternative to any other products created for skin irritations, massage, moisturisation, and general day-to-day skin care. Why buy several products when you only need one? Pot of Gold baby balm is specially blended to offer a perfect all round balm for both mother and baby that we believe will replace many of the products kept in your baby bag and medicine cabinet. Baby balm is made in New Zealand from 100% natural ingredients and is 75% organic too. While our Pot of Gold skin balm is designed for use on more severe conditions and ailments, Pot of Gold baby balm is a milder all-round daily use product, created with both baby and mother in mind. With a higher vitamin E content, and a softer recipe to ensure easy after-nappy applications, Pot of Gold baby balm ensures sensitive skin has the moisturisation and protection it needs. - Any chapping and chafing both mother and baby may have. - For cradle cap, eczema or similar conditions use Pot of Gold Skin Balm. Allergy warning: Pot of Gold skin balm contains coniferous pine tree resin along with beeswax which can in turn hold traces of pollen, propolis and bee venom. - Pot of Gold skin balm and Pot of Gold baby balm contain multiple natural vegetable fats. For this reason the balm should be allowed to absorb fully (usually five minutes) before spending prolonged periods in the summer sun. - Pot of Gold skin balm and Pot of Gold baby balm are affected by ambient room temperature and may seem very firm if the room temperature drops below 16c. Pressing firmly or rubbing your finger around the surface of the balm will warm a sufficient amount for most applications. - Clean/flush the area with saline solution or warm water. - Rub your finger around the jar collecting a thin film on your finger tip. - Apply Pot of Gold skin balm directly to the wound making sure to cover all exposed tissue. You can do this either by direct application or by applying the balm to a band-aid or gauze strip before covering the wound. - If necessary, cover the wound with a clean bandage or plain gauze band-aid. - Reapply and change dressing daily until skin seals over. - Continue to apply the balm on healing tissue until healthy skin returns. - First-degree burns are red and painful. They swell a little. They turn white when you press on the skin. The skin over the burn may peel off after one or two days. - Second-degree burns are thicker, have blisters and are painful. The skin is very red or splotchy, and it may swell a lot. - Third-degree burns cause damage to all layers of the skin. The burned skin looks white or charred. These burns may cause little or no pain because the nerves in the skin are damaged. Go to the hospital right away! 1. Run the burn under cold water for ten to fifteen minutes and pat dry. 2. Rub your finger around the jar collecting a generous film on your finger tip. 4. Allow the area to breathe as the balm is absorbed. With burns especially, the balm may take up to 30 minutes to absorb. This is normal and natural. 5. Repeat this application several times daily. 3. Apply directly to the affected area making sure that all damaged skin is covered. 4. Allow the area to breathe as the balm is absorbed. 5. Make a dressing from gauze or similar sterile material. Apply a thin film of balm to the material before using it to dress the burn. 6. Change the dressing every day. First, wash your hands with soap and water. Then gently wash the burn and put Pot of Gold skin balm on it. If the burn area is small, a dressing may not be needed during the day. Check the burn every day for signs of infection, such as increased pain, redness, swelling or pus. If you see any of these signs, see your doctor right away. To prevent infection, avoid breaking any blisters that form. For third-degree burns, go to the hospital right away. Do not take off any clothing that is stuck to the burn. Do not soak the burn in water or apply any ointment. You can cover the burn with a sterile bandage or clean cloth until you receive medical assistance. Once you hvae received medical assitance with your burn and it has begun the healing process, apply Pot of Gold skin balm as soon as possible to help heal the burns and to reduce scarring. - Rub your finger around the jar collecting a generous film on your finger tip. - Apply directly to the affected area making sure that all damaged skin is covered. - Allow the area to breathe as the balm is absorbed. - Make a dressing from gauze or similar sterile material. Apply a thin film of balm to the material before using it to dress the burn. - Change the dressing every day. First, wash your hands with soap and water. Then gently wash the burn and put Pot of Gold skin balm on it. If the burn area is small, a dressing may not be needed during the day. Check the burn every day for signs of infection, such as increased pain, redness, swelling or pus. If you see any of these signs, see your doctor right away. To prevent infection, avoid breaking any blisters that form. - Rub your finger around the pot collecting a thin film on your finger tip. - Apply Pot of Gold skin balm directly to the affected area at least three times a day, including after showers when the skin is clean and dry. - If your skin is itchy you can use the balm whenever you need relief from irritation. - Continue to use until skin appears healthy, then apply for an additional five days. - Reapply at the first sign of flare up to shorten recovery time. - Assess and remove the allergen causing the reaction to occur. Use Pot of Gold skin balm to help reduce acne scarring and uneven skin. - Apply to all acne prone skin each morning, night and after showers when the skin is clean and dry. - Use a pumice stone or loofah to gently remove any dead skin during showering. - Rub your finger around the jar collecting a thin film on your fingertip. - Apply Pot of Gold skin balm directly to the affected area. - For feet, apply in the morning before putting on socks, and for very dry skin apply again before bed until the area begins to soften. This condition is usually attributed to a fungal infection such as tinea. - Using a cotton bud, treat the area with 100% pure New Zealand tea tree oil. - Apply a thin film of Pot of Gold skin balm over the area to help aid in the healing process. - Wash your hands throughly and follow common athletes foot advice to minimise effects. - Apply Pot of Gold skin balm directly to the affected area several times a day. - Also apply before bed. The use of a natural Vitamin E product such as Pot of Gold baby balm from the begining of your pregnancy can effectively reduce or even remove the chances of stretch marks appearing during this time. Both Pot of Gold baby balm and Pot of Gold skin balm contain the most potent and powerful form of Vitamin E - alpha-tocopherol. With the concentrated Vitamin E found in our organic palm oil, and the incredible group of vitamins and minerals found in tree resin and beeswax, Pot of Gold skin balm is a healthy and natural skin food that can be used as a daily face and body moisturiser and under-eye balm. We believe the combination of ingredients will keep your skin supple, soft and radiant. - Rub your fingers around the jar collecting a thin film on your fingertips. - Apply Pot of Gold skin balm over skin and dab under eyes each morning. - Also apply after showering. With the concentrated Vitamin E found in our organic palm oil, and the incredible group of vitamins and minerals found in tree resin and beeswax, Pot of Gold skin balm is a healthy and natural skin food that can be used as a healing night cream. We believe the combination of ingredients will keep your skin supple, soft and radiant. - Apply Pot of Gold skin balm over skin each night before bed. Pot of Gold skin balm is a healthy and natural way to protect sensitive skin from the effects of make-up. We believe the combination of ingredients will also keep your skin supple, soft and radiant. - Apply Pot of Gold skin balm before applying make-up. Because Pot of Gold skin balm is made from all natural ingredients, it is safe to ingest and may be applied directly to the inside of your mouth, along the gum line and on your lips. - Apply Pot of Gold skin balm directly to affected area several times daily. Because Pot of Gold skin balm is made from all natural ingredients, it is safe to ingest and may be applied directly to the inside of your mouth, along the gum line and on your lips. Rub your finger around the jar collecting a thin film on your finger tip. Apply Pot of Gold skin balm directly to affected area several times daily. Because Pot of Gold skin balm is made from all natural ingredients, it is safe for eyes and may be applied directly to the corners of the eye socket to help heal any infection. Rub your finger around the jar collecting a thin film on your finger tip. Gently apply Pot of Gold skin balm directly to affected area several times daily. Because Pot of Gold skin balm is made from all natural ingredients, it is safe to apply on, in and near nasal cavities. Cover a cotton bud lightly in Pot of Gold skin balm. Gently apply Pot of Gold skin balm directly inside and around the nose several times daily. Because Pot of Gold skin balm is made from all natural ingredients, it is safe to apply to the inside of ear passages. Gently apply Pot of Gold skin balm directly inside and around the clean and dry ear. With the concentrated Vitamin E found in our organic palm oil, and the incredible group of vitamins and minerals found in tree resin and beeswax, Pot of Gold skin balm contains some of the world's best natural healing and calming properties, perfect for stings and bites of all kinds. Rub your finger around the jar collecting a thin film on your fingertip. Apply Pot of Gold skin balm directly to the affected area several times a day. Also apply before bed and after showering. Our organic palm oil is supplied by a member and sponsor of the Round Table on Sustainable Palm Oil, a worldwide organisation of palm growers, refiners and importers who are committed to sustainability. The honeybee (Apis Mellifera), secretes beeswax to build the walls of the honeycomb. When wax is secreted by the bee it is a transparent colourless liquid, which turns into a semi-solid substance on contact with the atmosphere. It is purified from its raw state by freeing it of solid impurities through melting and centrifugation. Provitamin A (carotenoids), Vitamin B-1 (thiamine), Vitamin B-2 (riboflavin), Vitamin B-3 (niacin), Vitamin B-5 (panothenic acid), Vitamin B-6 (pyridoxine), Vitamin B-7, Vitamin B-8, Vitamin B-9, Vitamin B-12 (cyamoco balamin), Vitamin C (ascorbic acid), Vitamin D, Vitamin E, Vitamin H (biotin), Vitamin K, Choline, Inositol, Folic Acid, Pantothenic Acid, Rutin, Vitamin P (nicotinicamide) . Calcium, Phosphorus, Iron, Copper, Potassium, Magnesium, Manganese, Silicoa, Sulphur, Sodium, Titanium, Zinc, Iodine, Chlorine, Boron, Molybdenum. Disstase, Phosphatase, Amylase, Catalase, Saccharase, Diaphorase, Pectase, Cozymase, Cytochrome systems, Lactic dehydrogenase, Succinic dehydrogenase. Fatty Acid, Hexadecanol, Alpha-amino butyric acid. Caproic (C-6), Caprylic (C-8), Capric (C-10), Lauric (C-12), Myristic (C-14), Palmitic (C-16), Palmitoleic (C-15), Uncowa, Stearic (C-18), Oleic (C-18), Linoleic (C-18), Aracidic (C-20), Benemic (C-22), Limolenic (C-18), Eicosanoic (C-20), Brucic (C-22). Tryptophan, Leucine, Lysine, Isoleucine, Methionine, Cystine, Thresonine, Arginine, Phenylalanine, Histidine, Valine, Glutamic acid, Tyrosine, Glycine, Serine, Proline, Alanine, Aspartic acid, Hydroxyproline, Butyric acid. Gums, Pentosans, Cellulose, Sooronine, Starch, Sucrose, Levulose, Fructose, Grape sugar, Reducing Sugars. Waxes, Resins, Vernine, Guanine, Xanthine, Hypoxanthine, Nuclein, Amines, Lecithin, Glucoside of Isorhanetin, Glycosides of Quercetir, Selenium, Nucleic Acids, Flavonoids, Phenolic Acids, Tarpenes and many other as yet unidentified nutrients. Grown on New Zealand's rugged west coast, the pine tree (Pinus Radiata) is the perfect source for our pure tree rosin. Containing a group of beneficial fatty acids, tree rosin can aid in the natural breakdown of over-production of keratin, which is present in eczema -prone and dry, cracked skin. The rosin allows these cells to shed, promoting the growth of new cells. 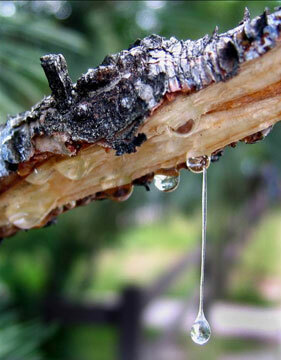 Tree rosin may also break down collagen, found present in scar tissue, and is a mild astringent, which can help dry out acne spots and cold sores. It is also interesting to note that bees create propolis by collecting a resinous sap from trees and then mixing it with wax back at the hive. Chemically, propolis is exceedingly complex and contains a rich variety of potent terpenes and benzoic, caffeic, cinnamic, and phenolic acids. It is also high in flavonoids, which by themselves may account for many of the benefits attributed to propolis. Some researchers refer to propolis as a type of flavonoid. Propolis acts against viruses, which antibiotics do not. A number of medical journal reports have discussed the role of propolis in fighting upper respiratory infections, such as those caused by the common cold and influenza viruses (Focht J, Arzneimittel-Forschung, Aug. 1993;43:921-3). Other investigators have reported that the cinnamic acid extracts of propolis prevent viruses from reproducing, but they worked best when used during the entire infection (Serkedjieva J, Journal of Natural Products, March 1992;55:294-302). Underpinning many of the benefits of propolis is the fact that some of its components, such as flavonoids and ethanols, function as antioxidant free-radical scavengers. A study published in the Journal of Ethnopharmacology (Jan. 1994;21:9-13) noted that some of the antioxidant phenols in propolis functioned similarly to vitamin E. In another article, researchers described that propolis had anti-inflammatory properties and that it could also prevent blood clots (Drugs Under Experimental & Clinical Research, 1993; 19:197-203). Sourced from family-owned plantations high in the mountains of Colombia, our guilt-free organic palm oil offers the best of the palm without endangering the rainforests or the Orang-utans that inhabit them. High in the antioxidant vitamin E (alpha tocopherol) and vitamin K, palm oil aids in the repair of dry, rough skin. Vitamin E is also recognised for its proven ability to help retain moisture in the skin while the high levels of vitamin K can aid in the repair of skin cells and damaged capillaries, helping tissue to heal. 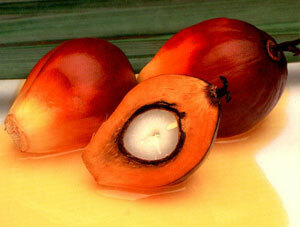 Palm oil is the largest natural source of tocotrienol, part of the vitamin E family. Palm oil is also high in vitamin K. According to studies carried out at the University of Kebangsaan, palm oil has several potent healing and protecting qualities, as explained below. Preferentially accumulates at the strata corneum of the skin. First line of defense against free radicals generated in the skin by UV/ozone rays. Prevention of skin aging and damage by oxidative rays. Being a more potent antioxidant, the tocotrienols neutralise free radicals at a faster rate and hence protect tocopherols. Protection against UV-induced skin damage and skin aging. Tocotrienols topically applied onto the skin were found to penetrate rapidly through the skin and the highest concentrations are found in the uppermost five microns. Tocotrienol-treated skin contained vitamin E at concentration 7-30 fold higher than control values. Tocotrienol augments the efficacy of sunscreens containing compounds that reduce penetration of or absorb ultraviolet radiation. Palm based tocotrienols have shown to inhibit human breast cancer cells irrespective of estrogen receptor status. Delta-tocotrienol was found to be the most effective tocotrienol in inducing apoptosis (cell death) in estrogen-responsive and estrogen-nonresponsive human breast cancer cells. Inhibits tumor growth of certain cancers. Alpha-tocotrienol and gamma-tocotrienol have shown to prolong the life span of cancer-infected mice. Gamma-tocotrienol is three times more potent in inhibiting growth of human breast cancer cultured cells than Tamoxifen. Alpha-tocotrienol has been shown to be 40 - 60 times more potent than alpha-tocopherol as an antioxidant in the prevention of lipid peroxidation. Delta-tocotrienol is the most potent antioxidant (highest antioxidant potency) of all commercially available tocotrienols and has been shown to be the most effective tocotrienol in inhibiting human breast cancer and liver cancer cells. Effective antioxidant in the prevention of protein oxidation and lipid peroxidation after strenous exercise for athletes, joggers and body builders. All palm oil used in our products is sourced from family farms in Colombia and is certified organic. New Zealanders must stop buying palm oil products if they want to save the critically endangered orangutan, according to a leading international conservation expert coming to Auckland this week. “Only 7000 orangutans are left, in Indonesia and Malaysia, due to their homes in the rainforests being cut down,” says Dr Peter Pratje, the director of Sumatran Orangutan Conservation Programme (SOCP). Image courtesy of Auckland Zoo. 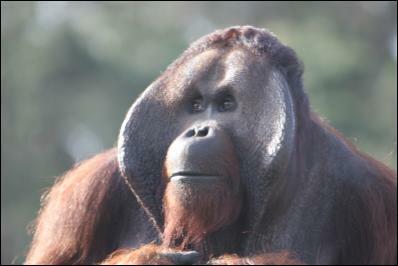 Auckland Zoo holds Bornean orangutans. This species faces the same dangers that impact on its natural environment as the Sumatran orangutan. The following is an article published a few years ago on the bbc news website. This is interesting information that all skin condition sufferers should be aware of. Pot of Gold skin balm and Pot of Gold baby balm do not contain steroids of any kind. We are always happy for anyone to have our product tested if they are in any way concerned. So-called "natural" creams for eczema have been found to contain the steroid drugs customers were trying to avoid. Researchers from Sheffield tested 24 herbal creams bought from herbalists, clinics and by mail order, and found the majority had traces of the drugs. Long-term use of steroids for eczema can cause permanent damage. The results, reported in the journal Archives of Disease in Childhood, have led to renewed calls for tighter regulation of herbal medicines. Eczema is an increasingly common condition affecting children and adults, and causes itchy rashes, pain and inflammation. One way of controlling it is by the use of corticosteroid creams prescribed by a doctor. These can produce a swift improvement, but many people do not want to use them, particularly on children, mainly due the risk of permanent skin damage, growth retardation and hormonal disruption at critical times in a child's development. Instead, some have turned to herbal medicines, and have paid for creams advertised as "natural" remedies rather than containing steroids. However, the research, led by Dr Helen Ramsay of the Royal Hallamshire Hospital in Sheffield, suggests that patients may be getting more than they bargained for. Of the 24 creams they tested, 20 contained "powerful or very powerful" steroid drugs in varying concentrations. Some - a type labelled "Wau Wa" - appeared simply to be a pharmaceutical steroid brand mixed in a paraffin base. Instructions suggested that it should be applied "all over", with no mimimum age. Following these instructions on a four-year-old child would mean applying almost 135 grams of cream a week - exposing children to potentially dangerous levels of steroids. The cost of the creams varied, but they were often far more expensive than the standard prescription charge. The findings suggest that little has improved since a similar study in 1999 found eight out of 11 creams tested were similarly laced with steroids. The practice is illegal, as corticosteroids are a prescription-only medication, and the Medicines and Healthcare Regulatory Agency - formerly the Medicines Control Agency - is vigorous in prosecuting suppliers who distribute such products. However, Michael McIntyre, a herbalist and the chairman of the European Herbal Practitioners' Association, says that there is a danger of the whole profession being sullied by a few rogue elements. He has been campaigning for tighter regulation of herbalism in the UK, and is hoping that a new EU directive, alongside UK legislation, could improve matters. He told BBC News Online: "This is a disaster - people are setting themselves up and there are no controls on them. "It's an outrageous case - giving out drugs for children that even an adult would not be able to safely put on their face." He said that he would be surprised if any "herbal" cream would have a swift effect on eczema. "There are no overnight herbal treatments for eczema - we try to improve things over a longer period. "The only overnight treatment is a steroid, so if that's what happens after you use a herbal cream, we'd suggest you get it analysed." FREE Delivery (within Singapore) available - refer to Buying Guide. Overseas delivery - please place your order with Free delivery option and make payment to reserve your order. We will advise on delivery charges. "I am writing to express my amazement at how wonderful your product is! My daughter developed eczema at around six weeks of age. Her cheeks were dry, crusty, itchy and weepy. The eczema spread around the body and seemed to be covering everywhere! As first time parents we were really concerned. We visited the doctor and got lots of moisturisers and hydrocortisone cream. The moisturisers from the doctor made it worse and the hydrocortisone cleared it up but it would return in a few days and we could not continue using it as often as we would have needed. So I searched the internet and found Pot of Gold skin balm. I liked that it was a New Zealand product and seemed very gentle and natural. I was very excited to receive it as I was hoping the before and after pictures I had seen on the website would be true for my little girl too! Thankfully within a day I saw improvements. It softened the skin and prevented the crustiness and weeping. Since starting it she has had no weeping. Her face is considerably better and in some patches the eczema is gone. I was so happy the product worked! 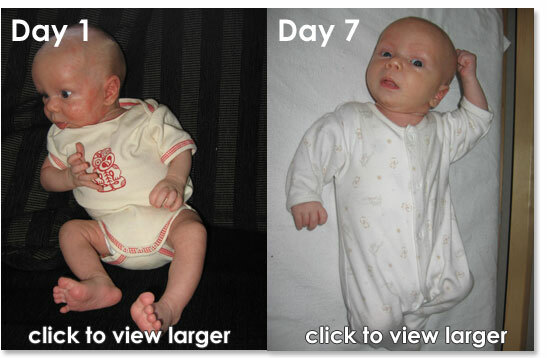 I am a convert and am spreading the news of our success to other mums and eczema sufferers. It really did relieve more than just the eczema - it relieved the stress everyone felt about the problem and made my baby so much happier! Thanks so much! Attached are some photos of the improvement!" "My Daughter has suffered from bad skin problems since she was born ranging from baby pimples to severe eczema. I have tried so many creams and remedies; however, none of them came close to such great healing than Pot of Gold. This product is amazing and I highly recommend it." "Wow! We have been using this cream on my 13-month-old daughter for five days now and there is a huge improvement, she’s had eczema all over her body since she was born and we had an eczema nurse visit us every week because it was so bad. None of the creams or bandages that she gave us ever worked, when my sister in-law showed me this website I had to buy some to try. We got the cream in the afternoon and put the Pot of Gold on her face and arms before bedtime. When she woke up the next morning her face was still red and dry but by 11am after applying the cream again her eczema was all gone. I was so happy that I almost cried. Three days after taking the pictures it’s looking even better - thank you so much!" "Thank you so much for letting us purchase Pot of Gold. It has been a godsend to see our five-month-old daughter's eczema improve in such a small space of time after trying numerous creams and lotions which didn't seem to do the trick. As you can see via the photos the redness has disappeared which started clearing only two days later. Our four-year-old son had eczema which he grew out of by two but we were unable to control it as much as we have done with our little girl by using Pot of Gold. Thank you so much." "I purchased a sample pot of Pot of Gold and used it on my four-month-old’s tummy and back. Before this she was very itchy with raised, red, dry, scaly skin. After just over a week of using this, her skin is no longer dry and rough. The redness is mostly gone and she is much happier not scratching all the time! I'm looking forward to trying it on my two-year-old’s eczema too!" Michelle - mum to Stella, four months, and Jessamie, two years. "I stumbled across Pot of Gold on TradeMe last week and loved the fact I could sample it first, without having to outlay over $20, although that amount can easily build up while trying hydrocortisone, alpha keri moisturiser etc. None of these really worked and I didn’t like the harshness of hydrocortisone on my two-year-old girl. I’ve noticed a huge difference in the texture of her skin, it was so dry and scaly before, but now feels like the rest of her body, with a tinge of pinkness still, and after the scratches heal it will be much better. I can’t wait to try it out on other things that arise, such as burns, scars etc." "I've tried so many things on baby's face and nothing has worked till I tried Pot of Gold. Her face is clear after seven days and I can use it on all of us. I am so glad I tried it. I will definitely be ordering more." "I bought your Pot of Gold skin balm last weekend and have just been using it for a little over 3 days now. The results are amazing. My 5 month old had eczema really bad all over her face. I had many comments from strangers telling me how bad it was. After only using it for 2 days there was already a remarkable difference. Thank you so much for this amazing balm." "My eight-month-old daughter has fairly mild eczema, but lots of it. We've tried all kinds of creams (Aqueous, Hydrocortisone, Alpha Keri oil) but nothing would shift it. I ordered a 15g pot from you last week and it's been awesome! I only tried it on one spot (the worst patch I could find - on her leg) and it cleared it within three days. I'll be putting it all over from now on. The photos I've attached are taken before, 24 hours later, and then after three days. Thank you so much!" "I have attached pictures of my daughter’s neck rash (the doctor was unsure if it was also eczema) and her eczema on her back before and after using Pot of Gold balm. The neck rash cleared after only two days of using the balm, leaving only a slight discoloration. The rash on her back is improving every day. The main bonus for me is that she is no longer itchy, which means that she sleeps for longer periods - wonderful! "I heard about your product for our son's eczema through a friend and was interested in trying it after hearing of their eczema success with Pot of Gold. We have been using it behind Seb's knees for about one week now and the difference is incredible. It didn't show improvement straight away but instead took a few days of applications before the skin started looking and feeling smoother and much less angry and red. We had to keep remembering to apply it at least twice a day so kept it beside his bed as our reminder. Seb is a much happier little boy (four years old) and it has shown me just how much he was worried about his eczema because he's genuinely relieved that Pot of Gold seems to be working. Maybe he'll be able to swim in the sea this summer after all and not have to be content with looking for crabs in the rock pools! Thanks for your help and also for creating such a wonderful product. I just wanted to tell you - and this probably should be added to my testimonial - that on the weekend Seb went into the sea voluntarily, running in and out up to his waist, with the biggest grin on his face! It was wonderful to see and all due to your product. So thanks again, it really was such a special thing to see him able to do that." is great too - fantastic on nappy rash! Thanks again." "After doing an internet search I found your product and bought a trial test of the Pot of Gold skin balm for my 20-month-old daughter who suffers from eczema, particularly on her legs. I have tried all sorts of other products, but yours is the ONLY one that has actually worked, which meant I could stop using hydrocortisone cream on her, which has been fantastic! I only wish I had found this product sooner, and recommend it to any mums out there who have children with skin prone to eczema." "One of my twin boys had really bad cradle cap and then developed a terrible rash on his face that the doctor said was infant acne. My midwife told me about Pot of Gold and I ordered a sample pot, which arrived the next day. I started using it straight away and noticed the improvement considerably, after three days it was very much improved and after one week all cleared up. My other boy has started to get mild acne spots on his face so I have started using it on him too. My baby is back to being beautiful and clear-skinned. Thanks so much!" "My nine-month-old daughter developed eczema; her skin had always been sensitive and prone to dryness, but it continued to get worse. At its worst it was red and raised and bumpy, and felt very dry. Most of her body was affected. Fortunately it hadn’t quite got to the itchy stage, but it was on its way. Luckily after searching the internet for natural eczema creams I came across Pot of Gold. After less then a week her skin was much improved; the redness and bumps had gone and there was no flakiness. Her skin felt lovely and soft. Now after continual use she barely has eczema, and any flare-ups are now easily managed with this balm. I am also very glad that this product is safe and natural, as I would never put chemicals or steroids on my baby's skin. Thank you very much, I shall recommend to all!" "The term "testimonial" sounds so forced. This isn't a testimonial, this is me wanting to share with as many people as I can the benefits of this amazing product. My 7-month-old daughter has had reccurring eczema on her face for 4 months, we have tried everything! The only improvement we have ever seen was when, out of desperation, we have used a steroid cream. Even then, two days later the eczema would return. These photos are of the amazing difference to her skin after only two applications, over a 12 hour period! We continued to use the product for another 3 days. There is no sign of the eczema at all! In fact she now has the most gorgeous skin! I have started using the product an everything I can think of. It is great for itchy bites too. Thank you so much to the makers of this great product, you have saved us, from possibly years of steroid use." "Wow, what can I say? This is an awesome product! I've renamed it 'miracle in a jar'. I only received it yesterday morning but by last night there was a huge improvement in my baby boy's eczema and this morning he woke up with none of the normal red blotchy dry skin on his face that he wakes up with every morning. Absolutely amazing, thank you so much." "I started using Pot of Gold for my daughter's eczema ten days ago and already there is vast improvement. Her skin looks and feels a lot healthier and is not so red looking. Thanks a lot!" "I just wanted to write to say a huge thanks for your amazing product! My six-month-old had developed eczema on his face, neck and upper chest and the usual prescribed medications were not doing a thing. After only a day his skin started looking better and now after using Pot of Gold skin balm daily for a week ALL his eczema is gone! Thank you, thank you, thank you! I've also used it on a few dry skin spots of my own that I've tried all sorts of creams on and they cleared up almost instantly! Many thanks." "Thank you so much. My son is covered in eczema and within three days behind his knees were no longer weepy and his arms had cleared and weren't dry and rough, his stomach is almost clear and he doesn't wake scratching in the middle of the night." "I thought I would give it a go after hearing from someone who bought the product that it seemed to help a lot (and not just buying it based on marketing spin). From what she had said it was about three days that it started clearing up for her so I was rather shocked that my son's skin has pretty much fully cleared up in 2-3 days, which is really fast compared to the creams that the doctor has given me and in some cases not worked at all. So you have a great product and I hope you get the word out." "Wow what a product you have here, it truly works magic. I bought a small jar of this magic for my grandson recently who had the most terrible eczema on his stomach right down to his upper thighs and now he has been cured 100%. I also have told many people about this product and as recently as today, I have brought quite a few bottles of this gold for others within New Zealand with 100% cured ratings. Better than any prescription that you can get from a doctor or chemist. Natural products work for sure, I am living proof of that. My hands were so bad with eczema that my hands were raw - no products that the doctor prescribed worked on me but Pot of Gold worked. So please keep making this product, it’s like being a kid again when things we bought worked the first time!" "We first noticed patches of eczema on Max's body when he was about 10 weeks old; by 12 weeks he had it on over 70% of his body. Our GP prescribed Aquaris cream for washing and moisturising. When we put it on his skin Max would cry and squirm, and his skin became very red and hot to touch. We persisted for two days, but after looking at the ingredients in Aquaris cream and doing some internet research we decided to stop using the cream. Whilst researching what we could use to help Max, my husband found Pot of Gold skin balm. We started using Pot of Gold straight away, within days we noticed a huge difference, and now almost two months later, Max's skin is 100% better. He still has a few patches here and there, but we have it under control and Max is a much happier little boy." "My son had a rash that was growing and getting worse and nothing seemed to help it. I did a Google search to find an organic solution and found you. We applied the Pot of Gold on average once a day for less than two weeks and he is completely healed. We saw a difference after the first day and some days even forgot to apply more. It's fantastic and I'm telling everyone about it." "Pot of Gold skin balm is an amazing product! 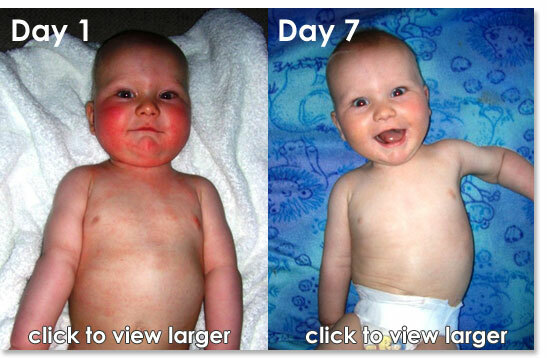 It works like magic for my son who had eczema since he was born. After applying a few pottles, his eczema has greatly improved. I'm now sharing the product with all the friends and relatives of mine and will send a bottle or two to those in need as a gift. I just recommended it to my aunt in Singapore. A lot of Hong Kong people are now suffering from all kind of skin problems due to air pollution, especially babies. Thanks so much that you're selling this useful product worldwide online. It's been of great help to us." "Kia ora, Pot of Gold is exactly that, thank you so much! I will definitely be buying more. My son's eczema cleared up over two days, which is amazing because nothing that I have received from the doctor has done that ever. Ma Te Atua!" "I have tried everything to fix my baby's eczema and I know it's a mixture of factors which contribute but all I wanted was a cream which healed and protected and I've found it! Pot of Gold is a true miracle and I wish more people wouldn't give in so easily to the temptation of using products full of petrochemicals like every product found in a pharmacy. Thanks Woody and his family. You are wonderful." "My four-year-old grandson has had eczema on his arms in the elbow crease since he was a baby. He constantly scratches it, especially while sleeping, and it is always a red and angry patch. Each year it gradually worsened until it was often bleeding. It also seemed to be spreading to his shoulders and back which were also itchy. My daughter had tried every remedy, sought professional help, nothing worked. Whilst in New Zealand on holiday earlier this year we were lucky enough to come across Pot of Gold balm. Within days, the angry soreness had disappeared and by the end of our fortnight's holiday all that remained were slight raised spots. A major miracle. I am recommending it to everyone and only wish it were on sale in Australia." "I have been told so many things about my baby's eczema and what I should and should not use. After buying your product from Woody in Christchurch, I had her cleared up in a little over seven days. This is a fantastic gift you have given our baby, and is also great on her nappy rash. Thank you." "My baby's eczema had gotten so bad around her neck that it looked like she had a thick weeping, red necklace on. The doctor prescribed all kinds of stuff that just made it worse. Honestly, I used this product on my baby for three days and it almost disappeared before my eyes. This stuff is so good its freaky and I am so thankful that I have finally found something that works on my baby. I am going to tell everyone about Pot of Gold. Thank you!" Assists & Promotes Healing using nature Aromatic balm Made entirely from natural and organic ingredients, Contains invigorating blend of essential oils. Massage oil every where you go into your temples and the back of your neck. Feel purified and renewed with a gentle massage using pure essential oils of juniper, grapefruit and fennel. Pot of Gold skin balm has been made and shared by the Crow family for six generations. In that time it has been attributed by family, and more recently our customers, with helping in the treatment and control of almost all skin related ailments and injuries. It is a natural product in the truest sense of the word. It contains no cortisone, steroids, petrochemicals, fragrances, synthetics, or carcinogens of any kind. Made in New Zealand from 100% natural ingredients and is 75% organic too. The skin balm works by feeding the skin a powerful skin food which simply helps your skin to do the healing itself.